Grandparenting – How Different Is It From Being a Parent? The signs are everywhere. Kids toting backpacks. Football. Pumpkin Spice Lattes. Fall is here. But technically we’re still in summer for a few more days. While I love fall, summer goes too fast and I look for any way to keep it alive as long as possible. One surefire way is The Beach Boys. Each year in late summer, they hold a concert in Ocean Grove, NJ, a beach town near us. It’s become a family tradition and our two youngest children, who are now 19 and 16, enjoy it most. There are two members of the early Beach Boys in this version – Mike Love and Bruce Johnston – and they’ve added younger, talented musicians to play the other parts. But the songs are timeless. And sheer fun. I first saw The Beach Boys in Boston Garden in 1973. They now play in smaller venues, and the crowd skews much older (I guess, including me). Love’s opening comment was “We love playing here. It makes us feel young.” But when you looked around, there were a significant number of young people, too. One of those young people was my son. Three years ago, he could not wait to leave. (“Can we leave now?”) Two years ago he became very interested in music and he did some homework. He came to the concert with much more interest and anticipation. (Dad, did you know that the Beatles used to study The Beach Boys?) 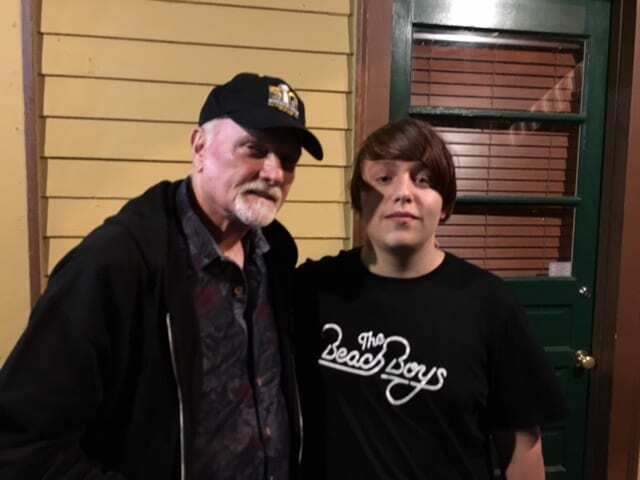 And he hung around in the rain with a friend after the concert and got his picture taken with Mike Love, who could not have been more gracious. It struck me that creating this spin-off band is their Second Act. As much as I was enjoying the music, I couldn’t help wondering what lessons could be learned. It’s safe to say that Mike Love and Bruce Johnston could be doing other things. Their tour schedule looks grueling. But they formed a new band to keep going. You can see that Love, 76, and Johnston, 75, really enjoy performing and interacting with their audience. It’s clear when someone loves what they are doing. Leaving the corporate world provides a second chance todo that. It is impossible to listen to the Beach Boys without appreciating the impeccable craftsmanship you hear in their harmonies. While Love and Johnston achieved it long ago, one of the best things retirement offers is an opportunity to pursue mastery of something you are deeply interested in and now have more time to dedicate to. If if mastery is never attained, the pursuit of it, in and of itself, can be very valuable. Maybe you won’t be doing a concert tour next summer, but we can all benefit by doing things consistently that keep us mentally and physically at our best. Love shared at the concert the importance of his daily meditation practice, that he’s maintained for decades, to both his personal and professional life. Having a set of healthy daily practices can make a huge difference and retirement offers a great chance to start them or take them up a notch. The most interesting aspect of this concert was hearing how well the classic Beach Boys and the younger musicians meshed together. As the show went on people, of varying ages, came down to dance and you could see how much Love enjoyed interacting with young people. The youngsters were clearly into the music (yet many were probably unaware that the two older gentlemen were part of one of the best bands of all time ranked 12th by Rolling Stone ). As the concert went on, I became more impressed with the energy level that Mike Love displayed. I had to remind myself that these are songs that he’s sung thousands of times. Was it another day at the office for him? In my mind, he performed with even more energy than I recall in 1973. While our Second Acts may or may not be as exciting as a lead singer of a rock band, bringing a high level of energy to whatever activities we choose to engage in can make a big difference. At 6 AM this morning, our son came downstairs to eager to share news with me. He woke up early because his current favorite band Weezer released a new single Beach Boys this morning and he wanted me to hear it before I left for the day. As I listened to it on the way into the city, the Beach Boys helped keep summer alive for another day. Really enjoyed reading this, very thoughtful article. So glad the Beach Boys music is still alive & well.